In these shabby old shops, I sometimes came upon Penguin books with a podgy penguin on the cover, quite in contrast to the streamlined bird familiar from modern editions. These early titles, dating from 1935 had a clean bold typography using Eric Gill’s classic sans typeface and could be bought for just twenty or thirty pence. So, in the manner of those cards you get in bubblegum packets, I began to collect any with numbers up to one hundred. In doing so, I discovered a whole library of novelists from the nineteen thirties and reading these copies passed the time pleasantly on my endless journeys. In particular, I liked the work of Eric Linklater whose playful novel “Poet’s Pub” was number three, Compton Mackenzie whose novel of the Edwardian vaudeville “Carnival” was ten, Vita Sackville-West whose novel “The Edwardians” was sixteen, T.F.Powys whose “Mr Weston’s Good Wine” was seventy-three and Sylvia Townsend Warner whose novel “Lolly Willowes” was eighty-four. After these, I read all the other works of these skillful and unjustly neglected novelists. I’ve never heard of most of these. Is it because I’m American or because of the few authors who achieve the spotlight, fewer still retain it decades later. But I so love the title “Lolly Willowes,” I’ll have to see if I can track down a dusty copy in one of our libraries. I will curl up and die if all books in the future are passed around in electronic files. No more travelling to bookshops all over the UK then! It’s striking that they’re all roughly the same size. Was that a criterion for their selection by the publisher? Dear Susan, I know you would love Lolly Willowes. My friend Barbara sent me the link to this – what a wonderful post! And how lovely to see Lolly Willowes and Mr. Weston’s Good Wine mentioned together, not to mention the wonderful Vita Sackville-West (have you read her book The Heir? It’s brilliant). Great post. There is a bookshop in Colchester where I live, which has boxes of these and I have spent many a happy hour in there having a rummage and a read. This love of Penguins is obviously widespread as the recent box of Postcards using the old penguin covers sold out so quickly before Christmas they were well nigh impossible to get hold of. I managed to get a set and spent a nostalgic trip looking through them all and remembering the books. Really enjoyed reading this. We have about 20 of the first 100 and enjoy collecting them in a very slow and haphazard way. We could probably buy them all from the internet in a day – but that would be no fun at all. what an interesting post and how interestingly you use language.my friend Barbara sent me the link to you so now I have ‘bookmarked you’ and shall visit often. I, too, have some old penguins but not collected in as orderly fashion as you. I have a penchant for the blue history series. A lovely read, also there was my other ‘lovely read’ on the shelf too. Anna of the five Towns by Arnold Bennett is one of my very favourite books . I have to leave it a few years between reads so it’s fresh again. Must be about time now, thanks for reminding me. These are so beautiful I want to take them to dinner and keep pouring them wine until they leave you for ME. This is beautiful — the books and your story both!!! What a lovely post! And such beautiful pictures! I love old Penguins too but there are so many of them that I’ve only been looking for favourite books or books I do want to read. I only have a handful so far as I just started last year. The idea of doing it by the numbers is a great one. I wonder if there’s a list of titles by numbers somewhere on the internet? Lovely post and lovely books. I pick up old Penguins in a desultory way but had not realised about the numberings — I shall be on the look out more seriously now. this is no yet another blog post, this is literature. spitalfieldslife.com is on my bookmarks list now. thank you ! My favourite Penguin Classic was also the first I ever bought. I loved the cover and the fact it was in mint condition, so I didn’t really mind about the content. Titled, The Social Life of Insects, I always thought it would be fairly dire to read. So I when I did actually pick it up I was amazed to find it a totally addictive read. It’s now definitely one of my re-reads that I m looking forward too! Lovely pics and post by the way! 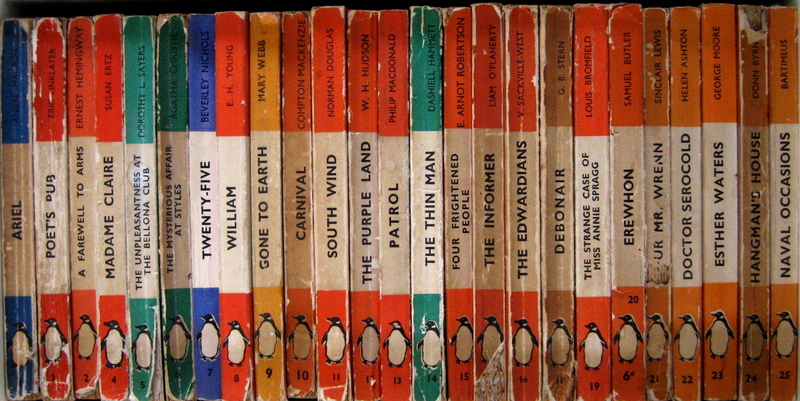 Reminded by this lovely post to look more closely at my own library, I noticed, seemingly for the first time, that Penguins have spines in different colours denoting the genre. Mine are mostly green, for crime (being a great fan of Margery Allingham) . What a simple and clever idea. I was directed to this blog from Persephone Books. Each day I visit Persephone Books blog where I always find a little treat to cheer me. 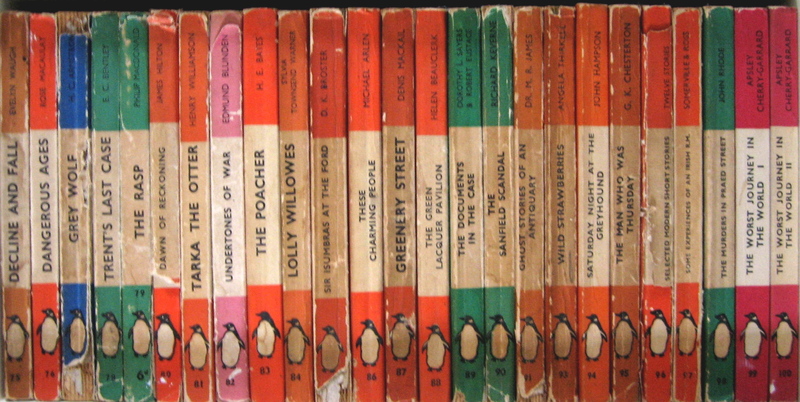 Today I found the wonderful photo of your Penguin books with a link to your blog. Your article was so interesting and informative. Thank you so much. I really enjoyed reading it. I too, like others who have commented, will be visiting again! I found you via Persephone as well – what a beautiful collection and a wonderful story to go with it. Books are the best souvenirs of life’s experiences! You have a terrific blog! Using the Persephone Books blog as my home page, I discover quite a lot about Britain of which I am otherwise unaware having been born and raised in the States, now living in Chicago – in this case that the early editions of Penguin were numbered. Are they still? The copy of Hazlitt recently sent to me by John Sandoe Books doesn’t seem to be. My two collections of British books are the Persephone series (now up to #86 – and which, should you choose to start reading them in order, might be best beginning with #3, then 2, then 1 before returning to 4, 5, 6, etc.) and the Agatha Christie first edition facsimiles. With the Penguin, I now have a new series to try and find and read. Thank you for the introduction. As a dedicated reader, I am very glad to have this site via Persephone Books. I look forward to visiting hereabouts again soon. What an excellent collection, rather reminds me of the second hand department of Waterstone’s on Gower Street…have spent many a happy hour lost over there! What a lovely collection! I have lots of paperbacks but am very fond of Penguins. I often buy second-hand ones and have all of Margery Allingham’s novels in Penguin. I inherited a “Penguin bookcase” sold in Heals, from my uncle, which was designed to hold Penguin paperbacks. I am also acquiring the lovely Penguin mugs which are so bright and cheerful. They are a cultural icon of 20th century. Enjoyed reading your story. Small point but Poet’s Pub is number 3 in the series. Number 2 was ‘a farewell to arms’. Hi ther, lovely collection. I myself am a big colelctor,I have about 500 of the first 1000 publications, all first editions. 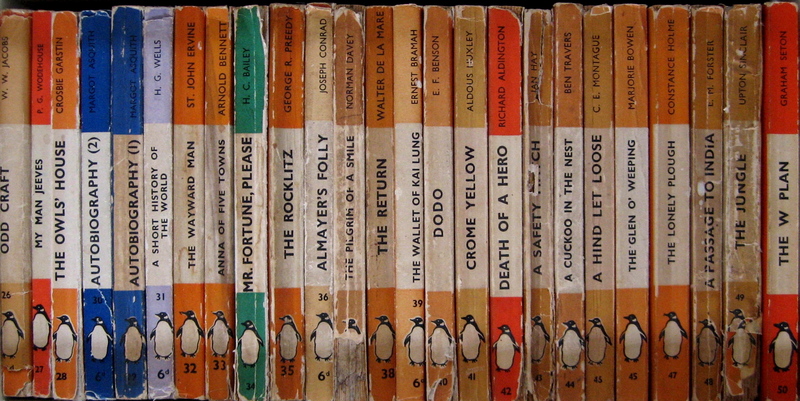 There is so much charm in these old penguin books, and they look great all lined up. If you ever decide to sell any of these please get in contact with me. Chrisjhouse@aol.com I’d love to add some to my collection. Googling “antique penguin books” I stumbled on this most beautiful site. I once had an old Penguin book that was the Letters of Vincent van Gogh, with a foreward by Johanna van Gogh, the book was yellowed, quiet, and, unopened, when I read it. I lent it. What was I thinking?! Unlike you, I barely ever see an old Penguin book anywhere here in Australia, so it is like a balm to stumble onto this site. What a wonderful collection. Reminds me of my parents collections year ago. I don’t know what happened to them all. I’m so glad my googling of ‘second hand penguin classics’ brought me to this blog post. Your books are beautiful, as is your story of their acquisition. Your collection has inspired me to expand my own. Thank you! You have a wonderful collection and I really liked reading your story. I started my own after finding a £1 copy of DH Lawrence’s The Lost Girl in near-perfect condition – there’s something so satisfying about scanning through shelves and seeing one of those spines. It’s been great for opening my horizons to different genres and authors, too – though many of the stories have been forgotten, the appeal of Penguins lives on and preserves them. Beautiful. 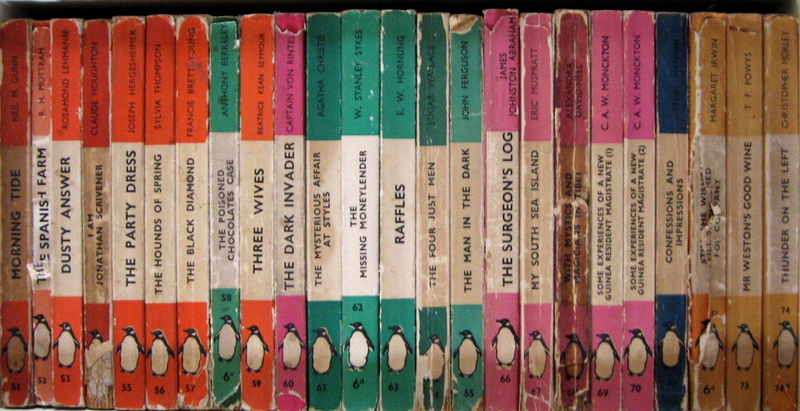 Someday someone (would love it if it was me) can show off a collection of slightly later penguins, when they started allowing illustrations on the cover but kept the three-color bars. I am proud of a Wodehouse that I have and a CP Snow also… Each with a monochromatic drawing that strikes the mood perfectly. I guess I am waving a flag for the 40s or 50s penguins. I’ve just stumbled across his site. I, too, am trying to amass the first 100 Penguin books without modern reprints, buying only the earliest editions I can find. At present I have 67 of the 100, and am stuck looking for No. 40 (Dodo). Good to see someone has managed the full set. The search continues. Gorgeous! I’m a total Penguin addict. In fact, I’m writing a blog entry on Penguin and Puffin right now: would it be OK to use your gorgeous pictures here, (with a link to this page), in my blog? If not, no problem, I thought it couldn’t hurt to ask! we have just wallpapered our downstairs loo with a penguin book wallpaper, have vowed to collect all the books depicted in it. HAdnt realised there were others like us. Like you, Gentle Author, I’m a collector of old Penguin paperbacks and I have about 50 Penguin books ranging from Selected Modern Short Stories printed in 1938, Lady’s Chatterley’s Lover printed in 1960 (when everyone was talking about it in that year), The Time Machine printed to celebrate H G Wells’ 80th birthday in 1946 , Cornwall Penguin Guides costing 6d printed 1939, Plato The Symposium printed in 1951 and one of my favourite authors, Guy De Maupassant’ book, Miss Harriet and other Stories printed in 1951. And like you I’m an anorak of Penguin books! Can I use one of these images of the Penguin books in a post? I will link back to this blog. It started with King Penguins. They were slim volumes with often very striking and individually designed covers. Took a while, but I eventually gathered them all up. Next came Puffin Picture Books. This is still a work in progress, but they match the KP’s for beautifully illustrated covers and interiors. This led to early Puffin Story Books, and subsequently Early Penguins. I think I am quite possibly beyond help. Wow, what a collection. But please, swap Farewell to Arms and Poets Pub around in that top picture. This has to be my favourite Gentle Author post to date. In my head, I can imagine you flunking an interview with an ultra efficient, unimaginative office manager, who cannot see further than the end of his provincial nose. Great post! Would you mind if I used these images on my blog (with a link here of course)? Nice post. I would think you’d mention Jan Tschichold with all he did for Penguin Books.